The perfect diving solution for small to mid sized boats, yacht tenders, sport fishing boats, etc. The VS1 Boat system shares the same motor/compressor as our popular VS Floating Hookah systems. We tweaked the configuration just enough to make it work perfectly for boat installations. 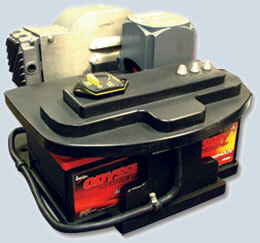 The VS1 configuration includes the motor/compressor with batteries on an easily mounted base. We added electronics to recharge the batteries automatically from your running engine(s). You can expect run times of 60-90 minutes on a fully charged battery set. Since the power source for the hookah set is self contained, you won't need to worry about draining your engine or house batteries while you dive. The system recharges automatically as you run to your next dive site. The compressor provides a smooth supply of air for up to 3 divers. It's an easy upgrade to add more family fun to almost any boat. (1) 100 ft down line with QRS fittings, (1) QRS Y-Divider, (2) 20ft diver hoses with QRS fittings, (2) Brownie’s™ patented Drop Weight Cummerbelts™, (2) Brownie’s™ hookah regulators, and deluxe mesh duffle gear bag. (1) 100 ft down line with QRS fittings, (2) QRS Y-Divider, (3) 20ft diver hoses with QRS fittings, (3) Brownie’s™ patented Drop Weight Cummerbelts™, (3) Brownie’s™ hookah regulators, and deluxe mesh duffle gear bag.